After Sunday mass at Holy Trinity, the parents left their four boys in Georgetown to drive to Griffith Stadium to join 27,000 fans to watch "Slingin' Sammy" Baugh take on the Philadelphia Eagles. Already a legend, Baugh was the greatest football player of his era. Record-setting passer, runner, punter, place kicker, defensive back. Yet, not until the fourth quarter did Sammy throw for a pair of touchdowns to finish off the Eagles 20-14. Something else was happening that Sunday. As the scoreless tie went on, there came a series of public service announcements calling on admirals, generals and officials to leave the stadium and report to their posts. Only when mom and dad left did they learn why. It was Dec. 7, 1941, and the headline on the extra edition of the tabloid press sold outside Griffith Stadium read in big war type: "Japs Bomb Pearl Harbor!" Seven years on, after a black Tuesday in the family on my 10th birthday, Nov. 2, 1948, the day Harry Truman waxed Tom Dewey, I was the privileged son taken out to see the Redskins face the same Eagles. But now the Eagles had the NFL's leading running back Steve Van Buren and the great All-Pro end Pete Pihos. Surfing the web to conform my memories, I came across some things I did not know then. Van Buren, an NFL immortal who would set all-time rushing records, had been orphaned as a boy in Louisiana. Pihos had a more arresting story. His father had been murdered. An All-American at Indiana, he had his career interrupted. He had been with the 35th Infantry under Gen. George Patton, took part in D-Day, was commissioned a second lieutenant on the battlefield, and won a Bronze Star and a Silver Star for bravery. And for a tiny fraction of what players make today, these tough men were battling it out in the '40s in a boys' game in leather helmets. Washington was another city then, a deeply rooted city, not the cosmopolitan world capital of today where our multicultural elites all seem to come from somewhere else. Yeah, I know. Pure unadulterated racism. We just didn't know it. "By changing his team's name," Redskin owner Dan Snyder "can create a better historical legacy for himself -- one of tolerance and mutual respect," says Halbritter: "Native Americans do not want their people to be hurt by such painful epithets." Hurt? Native Americans are "hurt" by the Redskins' name? Years ago, I recall hearing a line I thought a magnificent tribute to the toughness, bravery and perseverance of these peoples that the Europeans encountered and fought on American soil for centuries. "There is no whine in the Indian," the writer said. And as I have never heard of anyone choosing a team name to insult it, who is really lacking in tolerance and mutual respect here? 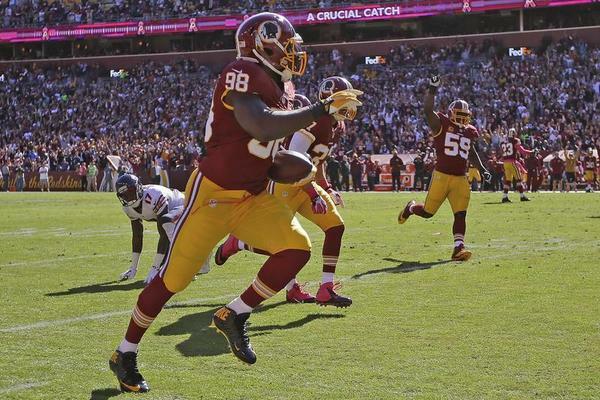 If Halbritter has a problem with the Redskins, he's got more problems than that in D.C. Among this city's great monuments is the memorial to Jefferson whose Declaration of Independence speaks of those "merciless Indian Savages, whose known rule of warfare, is an undistinguished destruction, of all ages, sexes and conditions." After burning and pillaging Atlanta and Columbia, S.C., Gen. William Tecumseh "Uncle Billy" Sherman talked of a "final solution to the Indian problem" and wrote his friend Gen. Grant: "We must act with vindictive earnestness against the Sioux, even to their extermination, men, women and children." Theodore Roosevelt dissented from Gen. Sherman's oft-stated view that the "only good Indian is a dead Indian." Said. T. R., "I don't go so far as to think that the only good Indians are dead Indians, but I believe nine out of ten are, and I shouldn't like to inquire too closely into the case of the tenth." And Teddy was a RINO. And so what are we going to do here? Edit Jefferson's declaration, tear down the Jefferson Memorial, pull down Sherman's statue, dynamite T.R. off the face of Mount Rushmore? Or maybe just tell the Oneida crowd we know how excruciatingly painful it must be to have to hear "Hail to the Redskins!" but are confident they have the moxie and the manhood to deal with it. Meanwhile, let's get back to the game.